Throughout my years of work, play and volunteerism, I learned early on that treating others as I would like to be treated was more than just a cliche I had learned in Sunday school, or an academic philosophical theory I discussed in philosophy class. It actually works when applied in real life! The Golden Rule, or “Ethic of Reciprocity” as it is referred to among academics, figures prominently in the history and evolution virtually all religions and cultures as a means of conflict resolution and ethical tradition. Among Christians, where The Golden Rule is most commonly associated with Jesus, it is considered a Christian fundamental law of life and an ethic to be achieved as each believer seeks life in the Kingdom of God. Jesus spoke of the reciprocal concept throughout the Gospels and it is referenced throughout the New Testament. So how does one apply The Golden Rule and make use of it in business and in life? As a Daily Money Manager, assisting with the assets and personal financial affairs of others, I am faced daily with situations that require my reflection upon the concept. When working with and making decisions regarding the property and assets of another, deciding how one would handle any given situation for himself may often be the best reasoning available. For example, when I see a billing charge from a supplier to a client that looks out of the ordinary or irregular, I take the time to vet it out rather than let it slide, just as I would if it were found on a bill to me personally. Or, when recommending a professional advisor to a client, if all things are equal, I generally decide toward recommending the same professional I would use for myself. 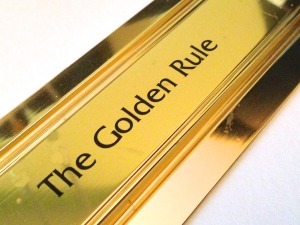 Using The Golden Rule as one of life’s guiding principles, a positive outcome for me has never been thwarted. I am involved in many various organizations to include church, service organizations, educational institutions, professional groups and many friendships. The principles of reciprocity are used constantly as I make decisions on how to respond to and treat others. Conflict is avoided and outcomes are positive. When I joined Kiwanis International a couple of years ago to be of service to youth and others in the Arlington community, I was surprised to learn that one of the six fundamental guiding principles of Kiwanis was “to encourage the daily living of The Golden Rule in all human relationships.” I realized that my prior personal discovery and use of The Golden Rule was obviously not revolutionary or unique, but a concept built on centuries of common sense and positive relationships. As you move on to your next blog or reading adventure, take the Ethic of Reciprocity with you as a gift from me and generations of others who have found it to be a successful solution to achieving a worthwhile and successful life in the Kingdom.